If you had invested in this fund in April 2006, would you still be invested in it? 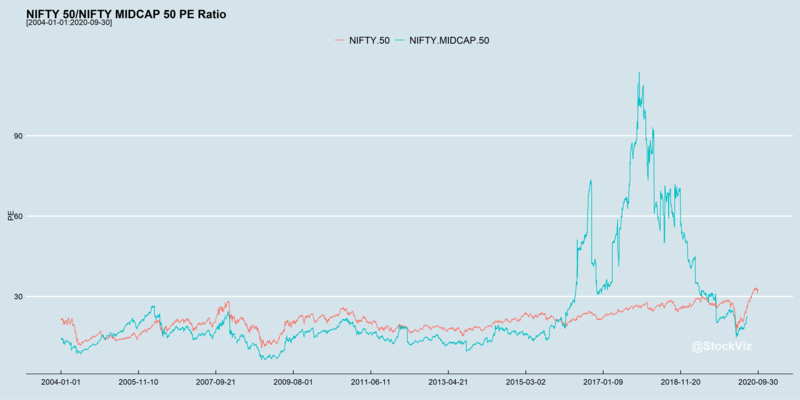 Between 2006-04-03 and 2019-03-08 (13-years), SBI Magnum MIDCAP FUND – REGULAR PLAN – GROWTH has returned a cumulative 268.66% vs. NIFTY MIDCAP 100 TR’s cumulative return of 321.39%. 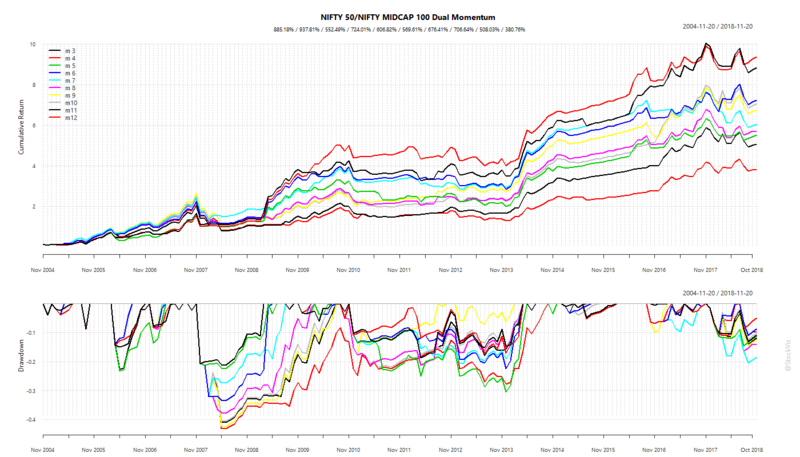 Annualized returns are 10.96% and 11.96%, respectively. 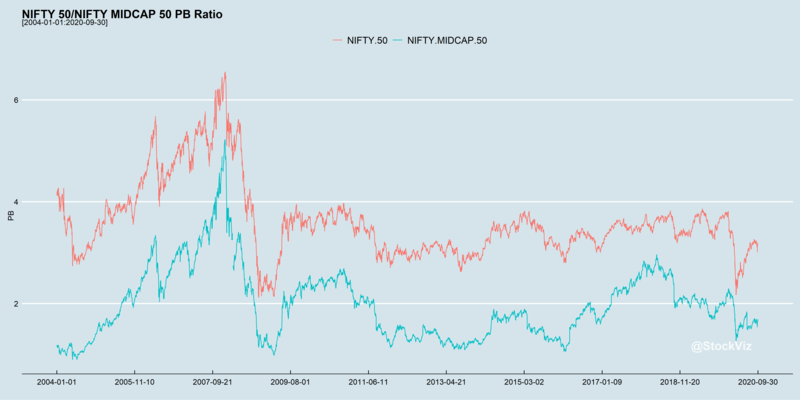 Between 2008-01-01 and 2013-01-01 (5-years), SBI Magnum MIDCAP FUND – REGULAR PLAN – GROWTH has returned a cumulative -27.09% vs. NIFTY MIDCAP 100 TR’s cumulative return of -1.54%. Annualized returns are -6.34% and -0.31%, respectively. There are over 40 asset management companies. Almost all of them have a midcap fund. Almost all of them claim to be “value” investors. Value, as described in Graham And Dodd, cannot scale to the 10’s of thousands of crores that these funds collectively manage. So almost all funds are, at best, index plus a value and/or GARP and/or quality tilt. And occasionally, fund managers blow it. They hop over to other funds. Or retire. And occasionally, the investing style goes through a bad patch. There is no way that any investor can dodge all these minefields. So, the risk that a mutual fund investor takes = market risk + manager risk + style risk + capacity risk. Investors should primarily allocate to index funds (take only market risk.) Actively managed discretionary mutual funds should be a niche. 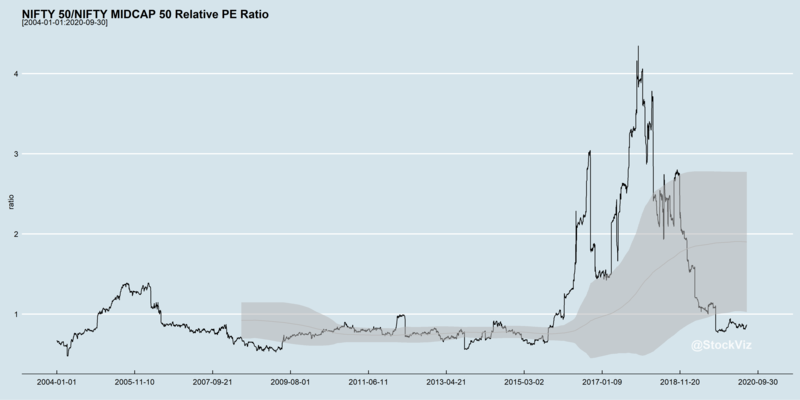 The NSE website has PE (Price to Earnings), PB (Price to Book) and Dividend Yields of indices going back a decade. Even though their methodology of calculating these has its drawbacks, they are consistently applied to all the indices. This makes an apples-to-apples comparison possible. In the next part, we will explore if these can be used to time or switch between large-caps and mid-caps. 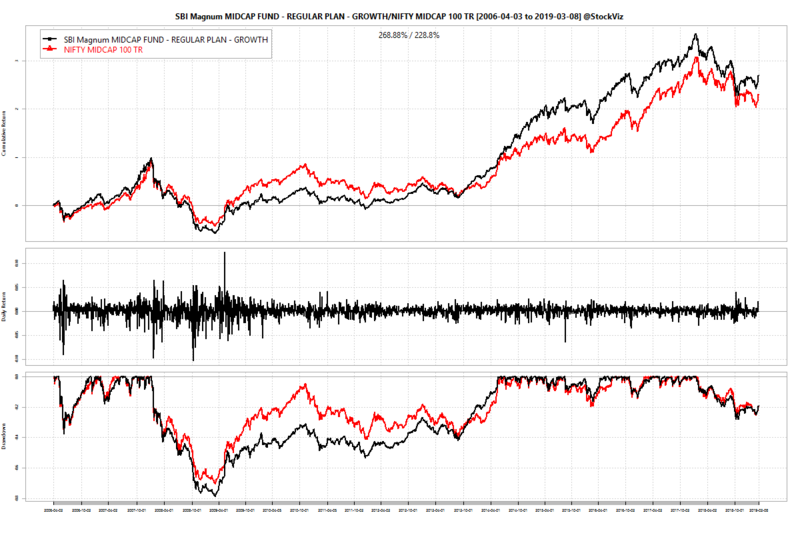 In Global Equities Momentum, we looked at how toggling between US Equity Momentum and World ex-US Equity Momentum ETFs gave superior returns to buy-and-hold. 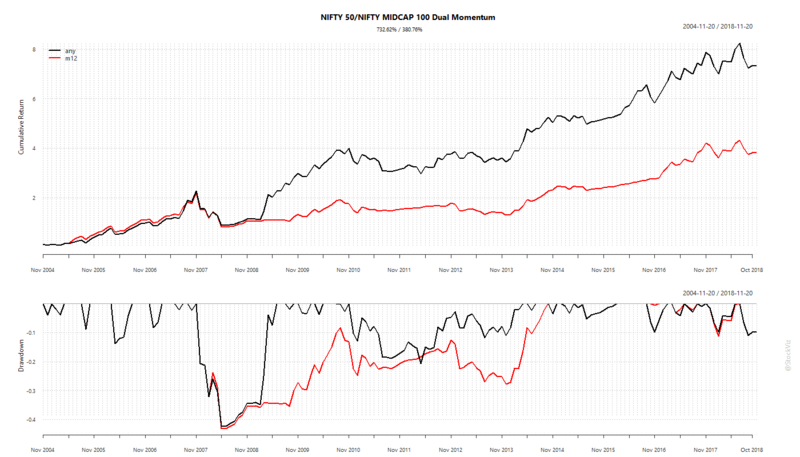 Can the same framework be applied to toggle between NIFTY 50, MIDCAP 100 and bonds? 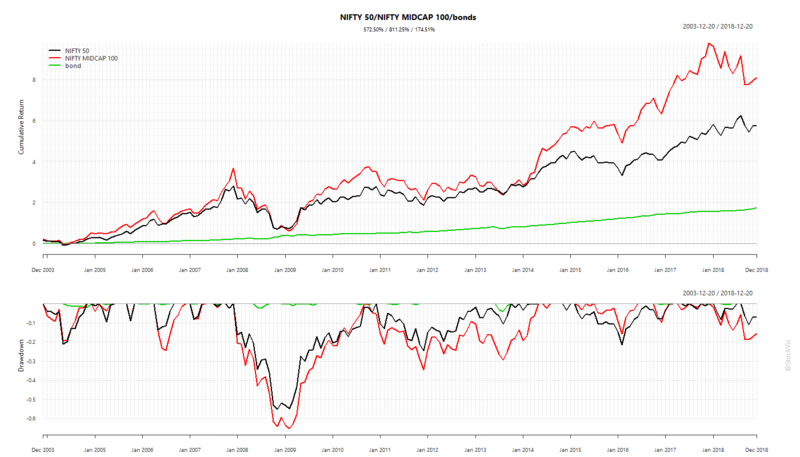 The line marked RELATIVE is the difference between MIDCAP 100 returns and NIFTY 50 returns. What we see here is that there is a high degree of correlation between the two when it comes to excess returns over bonds. 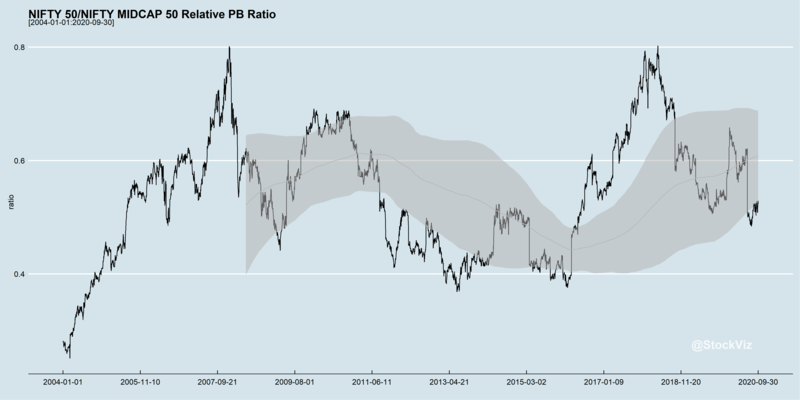 At the same time, however, the relative performance between the two equity indices tends to be sticky. 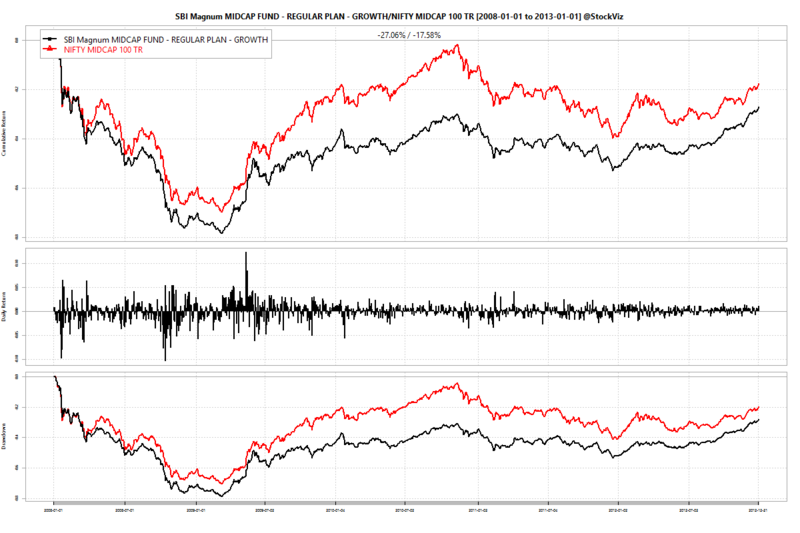 So, a dual momentum model tuned to sniff out the “regime” should be able to give returns better than buy-and-hold. 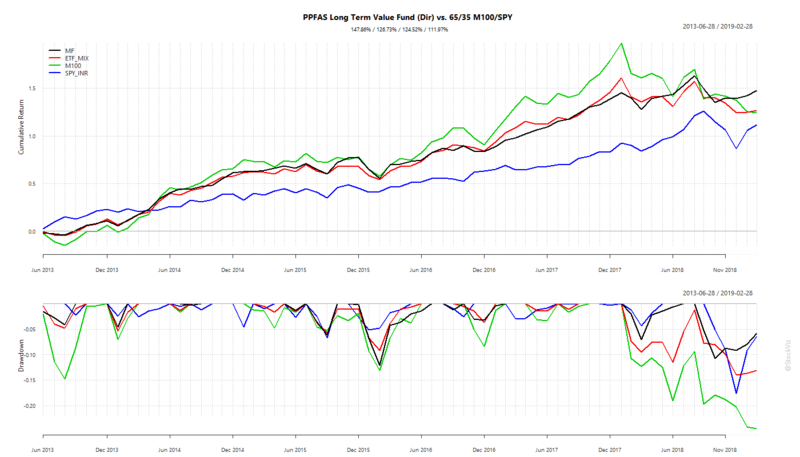 Over 3- and 4- month look-backs, the model does seem to show higher returns and lower drawdowns than buy-and-hold. But this is probably going to over-fit past data. But what happens if we specify the model to use “any” of the lookbacks? 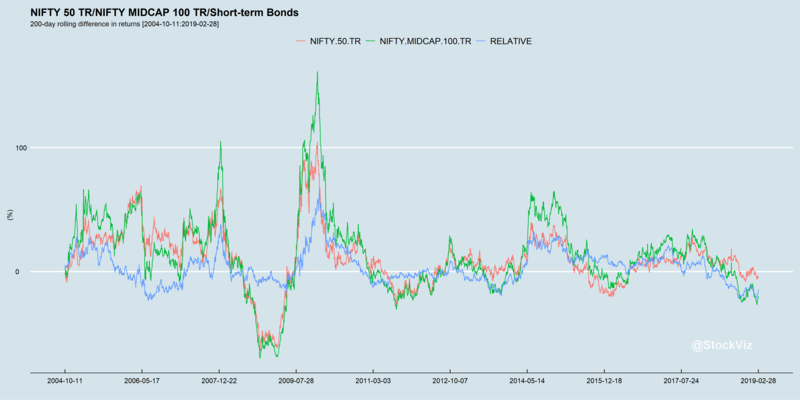 i.e., stay in equities if any of the look-backs signals the NIFTY 50 has out-performed bonds over the same period? 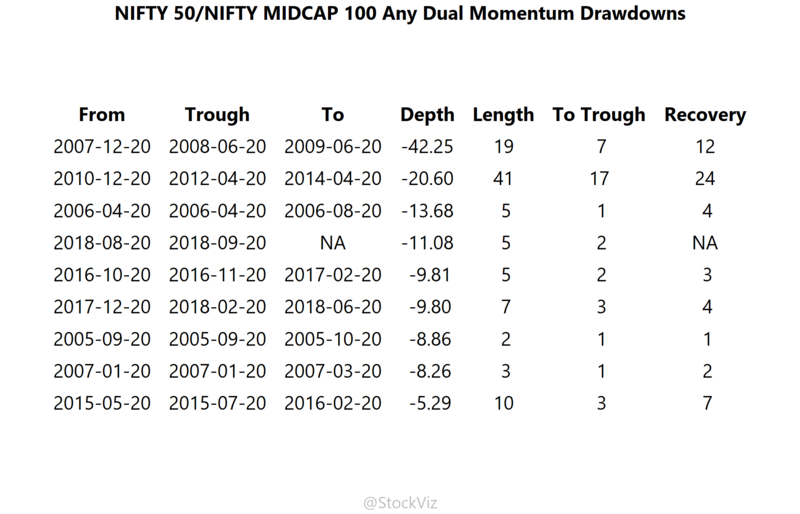 A model setup this way has lower drawdowns and returns that better than NIFTY 50 but lower than that of MIDCAP 100 buy-and-hold. It really just boils down to how much pain you can bear – for those with a lot of testicular fortitude, buy-and-hold MIDCAPs are the best. But for the rest of us mere mortals, this strategy makes sense. And unlike an SMA model that checks for potential trades every day, this one checks only once a month. This keeps transaction costs low for long-term investors.